Magdalena S. Palencia: A genuine approach to communication: Building trust and avoiding mixed messages. 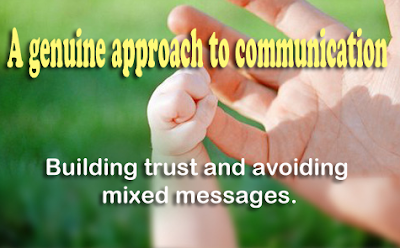 A genuine approach to communication: Building trust and avoiding mixed messages. Communication between an adult and a child is a two way street. Responding to a child’s smile or when they are expressing their discomfort with a cry is one of the many ways adults recognize the communication tools of a child. Studies confirm how talking to a child from the very first day benefits them as they learn reading, writing and problem solving. Though adults are accustomed to using verbal language to communicate, children grow first up using body language and non-verbal communication. It is essential for adults to maintain consistency in their verbal and non-verbal communication to avoid confusions that might end up affecting a child. A common way in which a child may be getting mixed messages is when adults change their voice to talk to a child. Adults may use baby talk to communicate with children because of tradition, cultural environments or simply out of emotion. Understanding what messages a child is receiving from such changes in an adult’s voice will be more apparent in the motivation behind doing so. Most commonly adults change their voice as a means of being warm and caring towards a child. A child will be able to read that they are being approached in this way so long as the love and affection is not expressed in an exaggerated or overwhelming way. Confusion arises when adults try to hide their obviously anxious or frustrated demeanor behind an insincere smile or a cute sounding voice. This often happens when something is very clearly wrong and, “for the sake of the baby” adults try to pretend everything is okay. A child who is constantly being shielded, through fake smiles and silly faces, from an uncomfortable situation will be confused and not know what to do. In cases when an adult is visibly upset, tired or angry they should, in an age appropriate manner, let a child present know. It is a means of communicating to the child that they too have the freedom to express any range of emotions when they feel them. It is not only happy or fun emotions that deserve attention and validation. 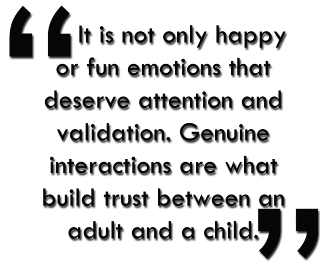 Genuine interactions are what build trust between an adult and a child. Parents are not always able to watch over their children and may have to turn to caregivers or daycares. Choosing who will be with their child is a matter of finding a person or institution parents feel they can truly trust. 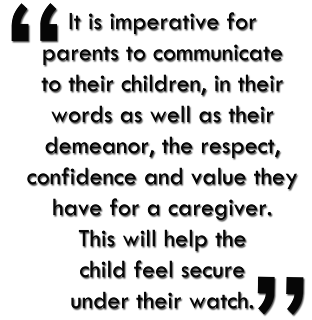 It is imperative that parents communicate to their children, in their words as well as demeanor, the respect, confidence and value they have for their caregiver. This will help the child feel secure when under their watch. Dismissive or condescending attitudes undermine any trust parents can hope their child will have with their caregiver. This not only affects the relationship between the caregiver and child, but it may also have an affect on how the child feels valued. Many times parents will see their children’s discomfort from a day with a caregiver or at a daycare for any number of reasons. In an effort to help their child overcome it, the parents may offer a treat or some sort of reward after the fact. 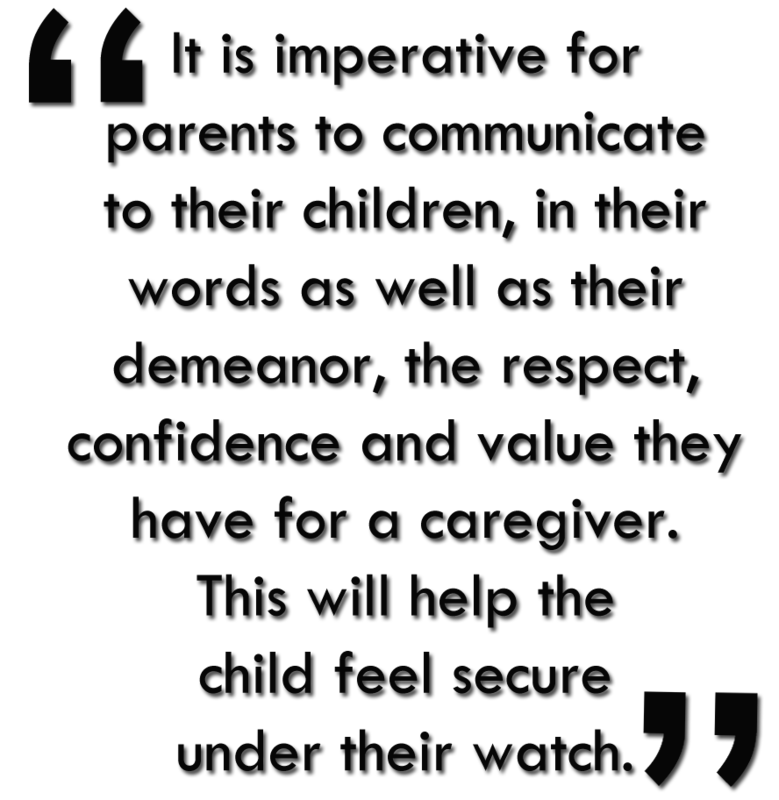 If a child is communicated the message that they are being routinely placed in an uncomfortable setting by their parents they will lose both trust in the caregiver as well as confidence in their parents. When situations arise, at a daycare or with a caregiver where the child may not be as willing to go, the best approach for a parent is to address in a genuine manner what it is that is making the child uncomfortable and then assure them that they will be with someone they know and trust in a safe place. This sends the clear message to the child that the parents are in control of the situation and they can be free to enjoy the day. It is important to keep in mind that the process of development of children is affected by separation from parents. This is why sometimes from one day to the next a child may manifest a completely different attitude about being separated. Children look to their parents as models for how they should behave(http://magdalenaspalencia.blogspot.com/2012/08/modeling-behavior-little-versions-of-us.html). Confusion arises for children when their same behavior at two different times provokes two completely different reactions. For example, if a parent gives a child a toy that makes noises, they will play with it and have fun watching the child discover and react to the different noises. After a while, more likely than not, the parents will grow less fond of that toy much faster than the child. Perhaps while on a phone call or after a hard days work, a child may suddenly feel the need to show their advanced understanding of volume with the toy. They could then be met with anger or disapproval. These moments can confuse a child who may not understand the full context of the situation. From the child’s perspective, what one day was so much fun for everyone, now inexplicably seems to be causing a problem. To help them to understand the differences, it is important to address briefly and simply how there are different times when it is better to do different things. Children continuously learn by observing their parents and those around them. It is important to understand that this takes place at all times and during all interactions, even if it is not the intention of the adult. Keeping consistency between verbal communication and body language by genuinely interacting with children is the best way to communicate with a child and avoid confusion. Teachers and therefore the tutors of any institute should develop a friendly and healthier sort of setting which incorporates sharing peace of minds, drawback finding skills, respecting others, positive attitudes and visit the site therefore the ability. It is important to keep in mind that the process of development of children is affected by separation from parents. This is why sometimes from one day to the next a child may manifest a completely different attitude about being separated.